This month, I’d like to shed some light on two of our favorite insect relatives – both of which are often misidentified, misunderstood, and all together mixed up. The time has come to clear up some misconceptions about these very long, many-legged creatures. Laurie and I are often suprised at how many people don’t know the difference between a centipede and a millipede, and we feel it is very important. Centipedes and Millipedes are Arthropods which which belong to a group called myriapods, meaning “many legs.” They can be found in all different types of environments on nearly every continent on the globe. Both have bodies consisting of a head, which bears chewing mouthparts, and a long trunk made up of several segments. That is where the similarities end. The word Centipede litterally means “one hundred feet”. In reality, they can have anywhere between 30 and 346 legs with one pair of legs per body segment. A Centipede’s legs originate from the side of their flattened body, which helps them move quite swiftly. They are nocturnal predators that spend their days hiding under rocks or logs. During the night they emerge to hunt for their prey, which consists of mostly small insects and other bugs, however, some larger centipedes may be able to take down frogs, lizards, or even mice! 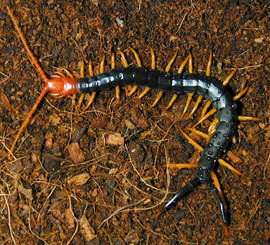 Centipedes have a pair of poison fangs directly beneath the head which they use to inject venom and paralyze their prey. They rarely bite humans, but will do so to protect themselves if handled. Most centipedes are of little concern because they are very small with mild venom. Millipedes on the other hand, are at the opposite end of the spectrum. These gentle creatures have a rounded body much like a worm. The word “millipede” means “one thousand legs.” They don’t really have that many, but for each segment on a millipede’s body, there are two pairs of legs. These guys can have anywhere from 80 to 400 legs! Millipedes are harmless detritivores which move very slowly. They live in the soil and feed on decaying organic matter and sometimes the roots and stems of small seedlings. Their main defense is to roll themselves into a tight ball covering their more vulnerable parts. Some species can also emit a foul-smelling defensive liquid which is not usually harmful to humans. Our native millipedes are very small, but some, such as the Giant African Millipede, can reach 12 inches in length and live up to 7 years. 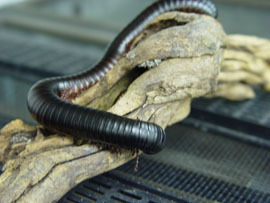 We have about 7 Giant African Millipedes, 4 of our largest are on diplay. Millie, goes to schools with us for our Bugs on Wheels program. The children have called her everything from a snake, to a worm, to a snail, to a caterpillar, and of course, a centipede. Well, I hope you’ll find this helpful next time you see one our funny long-bodied friends, and come and see our giants on display in the Brown Hall of Entomology. This website rocks!! SO AWESOME!!!!! The frogs and spiders are the best!!! Thanks people.now i know more about milli and centipede.welldone. Well, as stated in the article above, the word centipede means “one hundred legs”, but These are not insects. They are related arthropods in a separate class. Next Post Stare into the Face of Death!